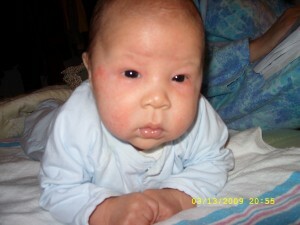 My son was born at home on January 17, 2009. 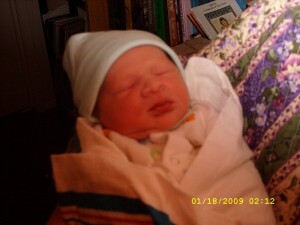 He was 7 pounds 12 ounces–just like his sister had been. Perfect. Precious. Adorable. We had no idea what was ahead. 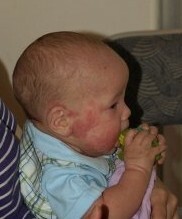 When he was around one month old, I started noticing what looked like baby acne. The doctor didn’t seem concerned about it. Then a few weeks later he started getting puffiness an redness around his eyes. You can see it in the next picture. Once we determined that this was not something in his eyes, we watched as it gradually spread and eventually he was diagnosed with eczema. I am familiar with eczema. My brother had it growing up, and we were able to control it with a limited diet and some cream that mom put on it. It was mostly on his tummy, and it bothered him some, but usually only if he ate something he wasn’t supposed to eat. I learned to read labels. He grew out of it sometime around puberty and eats everything today–even the wheat that he was born allergic to. But this was nothing like my brother’s eczema. Within two or three months it spread over almost his entire body, until he looked and felt absolutely miserable. Sweat irritated him, and summer was coming. I watched as the patches of “good skin” got smaller and smaller, finally disappearing under the onslaught of the advancing raw, irritated, itchy skin that is characteristic of eczema. I remember the doctor asking me about a “bruise” over his sternum. I hastened to assure her that that was no bruise, but rather a patch of good skin surrounded by bleached bad skin. You see, the eczema actually bleaches his skin. He got a light olive complexion from his father (who is Hispanic), but when suffering from the ravages of eczema he is whiter than I am. Although he didn’t look very white. He looked awful. Here’s a picture one of my cousins took of him when he was about six months old. You can see how red and irritated his cheeks were. Sadly, this was also the state of his tummy and thighs. The red patches were raw and oozing a lot of the time. Now, I had done some research, and I had heard that there was a link between eczema and asthma. That what was causing the skin irritation was toxins or something the body was getting rid of through the skin that was causing such irritation. The theory was that if this was suppressed (by the use of steroids) that the irritation would go inward to the lungs and cause asthma. 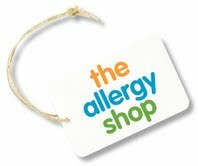 Indeed, many children with eczema also have asthma. For this reason, I was leery of using any steroid cream at all–even hydrocortisone. I used it only on the worst areas, and as sparingly as possible. During this time, I also tried to figure out what was causing this problem. I systematically eliminated wheat, soy, eggs, and milk from my diet, one by one, trying to figure out what was causing such a reaction. There was no change. (I should say that after testing each one, I added it back in to my diet, so I was only avoiding one food at a time.) Finally we had a rather unconventional allergy test done (electroacu-something–some kind of thing where they tested for electrical responses on the skin) and it pinpointed several foods. I cut those foods out of my diet. Nothing changed. I began to wonder how long it was going to take to see a change, since he seemed to be getting steadily worse. Then I heard about NAET. Desperate to try anything, we went for several sessions. Nothing changed. Granted, we didn’t give it long enough. But money ran out, and I’m not sure it was doing anything anyway. I don’t want to go into that here. I was willing to try anything, but I wonder if it is a valid thing or if it something dangerous. I don’t have the answer. All I know is, it didn’t work and we’ve moved on. By this time, I was really becoming emotionally drained. Trying to deal emotionally with the fact that my precious baby was suffering so much was just too much for me. I will share more about that in a future post. Next week I will share with you more about the things we tries in terms of diet to find a solution. I will post an instalment of this series every Friday morning until I finish–however long that takes. So stay tuned to see how I coped and what turned things around for us, and consider subscribing so you don’t miss out on the rest of the story. This post was originally published on the Life of a Happy Mom blog. You can read more comments on this post here. This entry was posted on Friday, January 7th, 2011 at 5:00 am	and is filed under My Story. You can follow any responses to this entry through the RSS 2.0 feed. You can leave a response, or trackback from your own site.